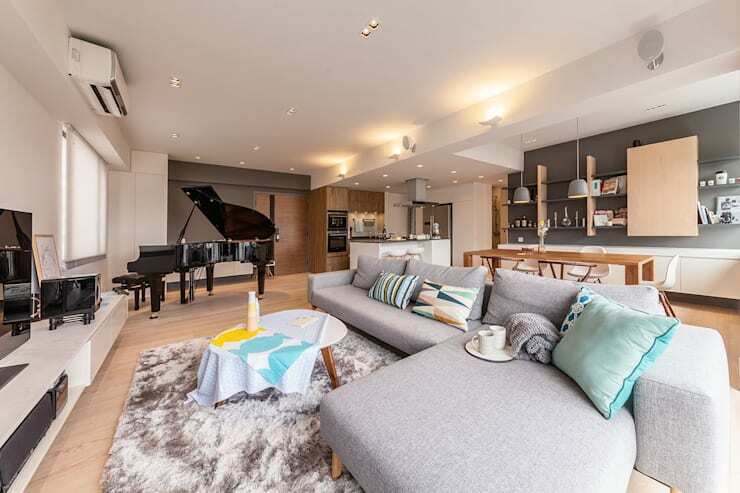 Located in bustling Hong Kong, this beautiful home showcases the very best in stylish apartment living. The dwelling is decorated to perfection, evoking a calm and spacious air throughout its open kitchen, living and dining areas, and endowing the bathroom and bedroom with relaxed sophistication. The project comes courtesy of Hong Kong's Arctitudesign, who embraced the commission with a view to create a home that would guide natural light and fresh air throughout the space, generating a calm, inviting oasis in the midst of Hong Kong's iconic metropolis. The feat has well and truly been achieved, with the home's relaxed aesthetic combining classic elegance and modern sophistication, with hints of colour throughout adding a layer of personal character. Expansive living areas provide the optimal locale for socialising and relaxation, while the enviable luxury of the large bathroom and bedroom are a pleasure to behold. Take a visual tour and see how subtle, simple touches can transform a metropolitan apartment into a cosy and inviting home. The entrance to the property is simple and stylish, giving a taste of the modern aesthetic characterising the rest of the home. The warm wood of the front door contrasts beautifully with the colour scheme of cobalt grey and cream, both of which are reflected in the accompanying furnishings. Atop a simple rug lie two cosy pairs house shoes, the beginnings of an essential ritual for apartment dwellers, as they cast of the shackles of the day and wander the house in clean-footed comfort. 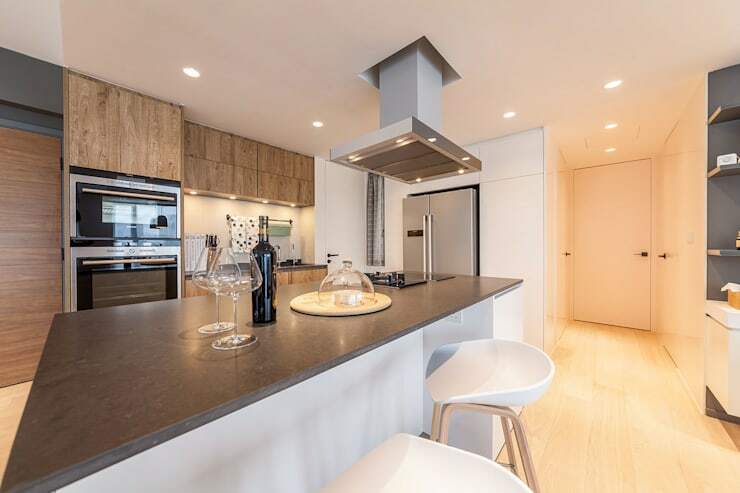 This view of the living area lends insight into the openness of the apartment, with kitchen, dining and living areas combined for an expansive feel. The grand piano in the corner presents a luxurious design feature, enhancing the space with classic elegance and providing a point of interest to all who enter. Its glossy, black finish stands out in glorious contrast to the more subdued hues of the surrounding decor, infusing the home with creative energy and sophistication. The living area of the home presents an atmosphere of relaxed simplicity, with light and air streaming through the balcony doors and windows to refresh the lively, chic decoration. The grey tones of the couch and rug provide a subtle but strong background to the smattering to colourful cushions and blankets strewn about the space. A state of the art multimedia system perches atop a streamlined, alabaster credenza, waiting to entertain occupants and guests on a relaxed night in. The dining area of the home carries through the colour scheme of wood, cream and grey, with the stylish, streamlined table and colourful dinner setting adding a contemporary edge to the space. Grey hanging lamps provide ambience for entertaining or during a cosy, private dinner. The bookshelves on the far wall display multiple points of personal interest against their subdued, grey back drop, personalising the space with a unique sense of character. White storage units frame the space for functionality, with a generous array of windows allowing for maximum illumination and providing a stunning view of the city beyond. 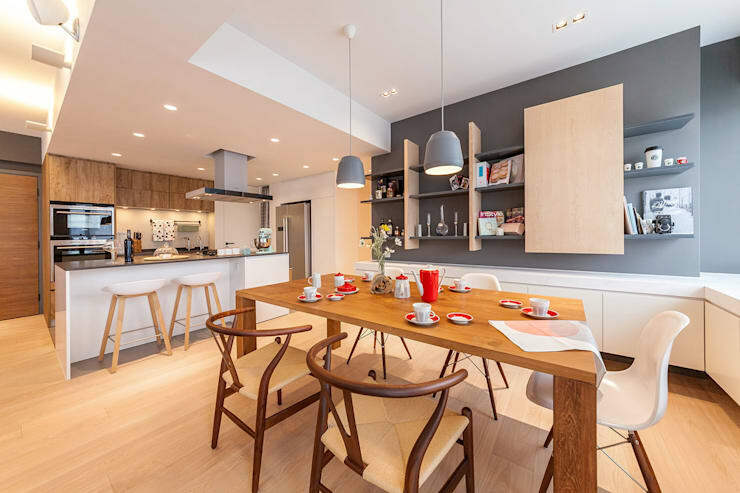 The kitchen area has been subtly delineated through the use of a contrasting colour scheme, with the darker tones of the grey kitchen island and wooden storage generating depth within the space. The kitchen appears streamlined and functional, with stainless steel and black accompanying the grey finishes and ingraining a contemporary feel. The area is spacious and inviting, combining beautifully with the remainder of the home, which flows in an inter-connected, interactive harmony. The bedroom of the apartment boasts a glorious king-sized bed which takes centre stage within the room's plush, comfortable atmosphere. 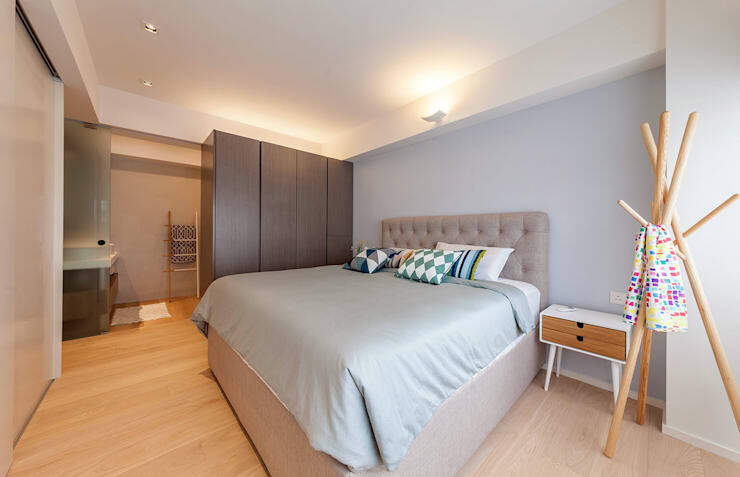 Bright cushions enliven the grey of the bed and neighbouring wardrobe, while the wood and white of the bedside table and coat rack add functional, contemporary touches to the room. In the background we can see the beginnings of a open bathroom, with the design of this space replicating the inter-connected atmosphere of the living area. 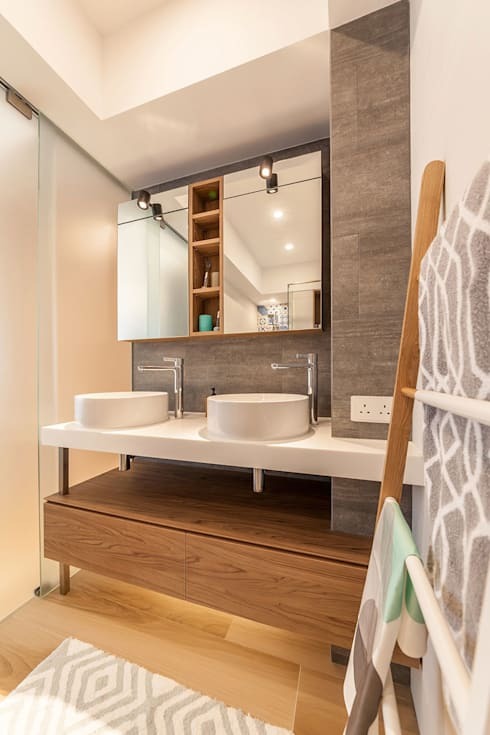 Moving through to the bathroom and we observe the use of grey tiling once again adding depth to the space and the use of warm, wooden finishes adding an inviting element to the room. The large, modern ladder resting against the wall provides a visible, functional storage area, while the dual sinks and expansive shower present ample room for a city couple to combine their morning rituals. The lighting in this space is particularly thoughtful, with mounted spotlights illuminating each sink and mirror, subtly personalising the space for the occupants. For more great ideas about apartment living, have a look at Family apartment, Hong Kong to get inspired! 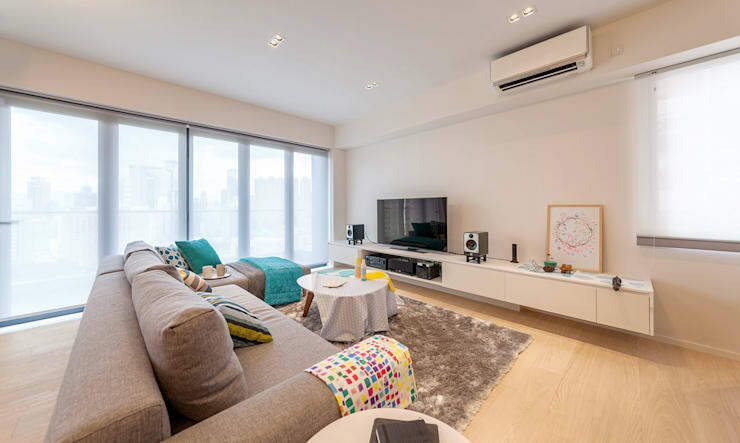 Which design feature from this cosy Hong Kong apartment would you like to include in your own home? Tell us below!